Summer is officially over, the fall days are dwindling away, and it's time to put the boat away until next spring. Unfortunately storing your boat for the winter consists of more than pulling it out of the water and parking it in your driveway. Many towns and neighborhoods have policies against parking boats or recreational vehicles in your yard, driveway, or on the street. 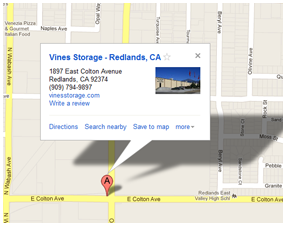 When searching for outdoor boat storage in Redlands you have many options. Dry docks are available at many local marinas. While this may be a great solution during the months when you're using the boat frequently, you may be better served to look for a location offering better amenities, security, and leasing options. Vines Storage offers all of these benefits and more. The facility is completely secure with an eight foot wall, manned gate, and many security cameras. In addition to indoor and outdoor storage units for boats, cars, recreational vehicles, and household items, Vines Storage also offers amenities; such as ice, compressed air, and a waste dumping station. It's these benefits, along with personalized service, that keep the facilities clients coming back year after year. For individuals who are looking for outdoor storage for their boat for the winter, Vines Storage offers the following reminders before putting the boat away for several months. Change the oil and other fluids. Be sure to consult the owner's manual to determine if any of the fluids, such as antifreeze, should be diluted prior to storage. Spray the engine with fogging oil and remove drive belts which can crack when kept under tension for long periods of time. Disconnect the battery to ensure it doesn't drain all the power over the winter. Fill the gas tank to ensure condensation doesn't build up in the gas tank. Seal all of the exhaust ports to keep small rodents and pests out of the boat's mechanical system. Clean up any trash, wipe down the seats, and remove any loose cushions. Wash and wax the exterior to help prevent rust or damage. Be sure to use a cover in order to keep dust, dirt, and weather elements from damaging the exterior or interior of the boat. If you're considering outdoor boat storage, be sure to visit Vines Storage to learn more about your leasing options.